I don’t mind being backed into a corner to fight on behalf of a musician or their work. In an era of overzealous fans, or “stans,” I’ve often rallied behind an artist’s more questionable choices or what I felt was an overlooked gem from their discography. I’m not above blasting the sax intro to Carly Rae Jepsen’s “Run Away With Me” at a dismissive friend. OK, cue the haters, but I love show tunes. Sure, I have a range of other fave genres and go-to playlists, including classic rock, indie rock, danceable pop and ‘90s hip-hop, but when I’m in the mood to feel the feels, and especially if I’m alone in my car or kitchen and want to sing along, I turn to Broadway. From the stalwarts like “West Side Story,” to deep cuts like Andrew Lloyd Webber’s “Aspects of Love,” to contemporary, instant-classics like “Dear Evan Hansen,” I am a sucker for a dramatic plot, a clever turn of phrase, a toe-tapping melody, and a belting ballad. If you’ve not heard Cy Coleman’s “City of Angels,” you’re missing out on some delicious fun. “Les Miserables” always brings a tear and sends goosebumps during the sweeping final verse of Jean Valjean’s “Who Am I” or the heart-achingly beautiful “Bring Him Home.” Every. Time. A lot of people find show tunes too cloyingly sweet or unsophisticated musically — and I see why. But the heart wants what the heart wants. The lyrics are truly terrible. Like this: “I’ve been broke and I’ve been hungry/ I think they’re both my middle name.” Or this: “I could be as gentle as a newborn/ Then spit into the eye of a hurricane.” Um, what? “Jovi couldn’t bluff his way west of Newark with these lyrics,” Rolling Stone wrote in its 1990 review. Released after their breakthrough “Black Album,” “Load” had a lot of old-school Metallica fans tearing their impressively long hair out. The thrash metal sound of “Master of Puppets” and “Ride the Lightning” was replaced with a weird, alt-rock metal sound. The band also cut their hair. I personally love this album and its companion “Reload.” James Hetfield expanded his singing range and started writing more thoughtful, introspective lyrics. He seemed right at home in country-infused songs like “Mama Said” and “Ronnie.” Some of the Load’s songs are classics. “King Nothing” is a fantastic metal song and “Bleeding Me” might be a Top 5 Metallica song. “Load” is no “Master of Puppets” and not all the songs are winners, but I think its highs are worth its lows. I’ve always loved Reba McEntire’s album “Rumor Has It’ and specifically “Fancy” as a song, but I adopted it as almost a personal anthem after I moved away from home, to Washington, D.C. — a place where it’s hard to hit a solid country music station on your radio dial. I belt it out while stuck in Beltway traffic; it’s a song about an outsider who made good, and also references a mother selling her daughter off as a prostitute. That storyline has earned criticism from some people I hold near and dear, who wonder what kind of message it sends. But Fancy’s grit and refusal to submit to the expectations of the world (“I mighta been born just plain white trash but Fancy was my name!”) ignites a fire in me every time I hear it. Boy: No, not Kesha. Hell no, never. Mom: You know, someday you might meet a girl who wants to listen to Kesha with you. What Kesha’s “Rainbow” really brings back is fond memories of my formative years: The Breeders, Chrissie Hynde and my all-time favorite, Liz Phair. I still sneak Liz Phair into the family playlist every once in a while. Most of the songs from “Exile in Guyville” are on pause until my daughter is older, but for now, we love to sing along to “Uncle Alvarez” from “Whitechocolatespaceegg.” Can’t explain. It’s just fun. It’s also when my son reaches for his headphones. By far it’s Mr. West’s most underrated body of work. In 2008, marked by the death of his mother Donda, West released his most vulnerable and emotional album. He bypassed the bombastic rap, hip-hop and R&B beats that defined his first three albums for a pop-electronic infusion. Singing without reservation, he created auto-tuned masterpieces like “Say Your Will,” “Street Lights,” “Welcome to Heartbreak,” and “Paranoid.” Not only did the album lay the foundation for West’s best album to date, “My Beautiful Dark Fantasy,” but also became the bedrock for hip-hop music today. Rappers like Drake and Rae Sremmurd’s Swae Lee and Kami constantly channel Kanye’s reckless sing-song style. It may not be his best album, but it transformed him as an artist and our taste for music as listeners. Not since John Lennon’s proclamation that the Beatles are bigger than Jesus has a pop star been as blasphemous as Kanye on his sixth studio album. “Yeezus” is abrasive and in-your-face. It’s Kanye at his best, declaring with no shame that he “is a god.” In “Blood on the Leaves,” which samples Nina Simone’s “Strange Fruit,” Kanye the producer shines through. The album is brutal in its sound and its subject matter, ranging from consumerism and black culture to his own discomfort in his relationship with women, despite his marriage and new baby daughter. 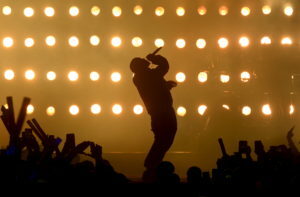 Unlike his previous albums, there was no radio hit like on “College Dropout” or “Graduation,” no genre-changing masterpiece like all of “808s & Heartbreak.” And it certainly was not like its predecessor, “My Beautiful Dark Twisted Fantasy,” which cemented Kanye among the greats in the genre. In “Yeezus,” there is an obvious desire to reject and redefine what a successful or popular record should sound like look like. The record confronts uncomfortable topics like misogyny, insecurities and modern-day racism. And it doesn’t allow for the listener to get complacent, from the abrupt production in “New Slaves” when Kanye’s verse over a minimalistic beat drum rolls into a melodic Frank Ocean outro, to the sparse and jarring “Send It Up.” It’s bold, brash, and as anti-establishment as one of the biggest pop stars on the planet could sound. As a teenage girl in the mid-2000s, catching “1D fever” was a rite of passage, one that came with the burden of defending “that silly girl music” for the rest of my life. Now, I don’t care if you don’t like One Direction’s music, but too often I find myself defending the band — and its members who’ve since gone solo after the band’s hiatus — against critics who claim their music is insipid or talentless for the sole reason that its primary audience is teen girls. As if young women can’t possibly like “good” music? Why has Reggae dropped off the pop charts? We surely haven’t resolved the need for political protest music to bring people together, but you never hear it on the radio. Walk along a sweaty summer avenue in New York City circa 2006, and you would have been hard pressed to miss this rapper’s raspy timber. What’s his mother-given name? Jeffrey Bruce Atkins — better known as Ja Rule. At the turn of the century, as the era of radio singles seemed to make way for “complete” albums, Ja Rule remained firm, pumping out summer jam after summer jam. “Holla Holla,” “Between Me and You,” and “Put It on Me” … That’s just 1999 and 2000. Many accuse Ja Rule of mimicking DMX, but when was the last time DMX did a duet with Jennifer Lopez or Ashanti? His series of duets reinforced the foundation of a rap-and-R&B flavor that continues to this very day. Put on the “I’m Real — Murder Remix” and I dare you to not sway your hips or bop your shoulders. Can’t be done. Sure, Ja has had his legal troubles, questionable but prescient commentary on North Korea and more than his fair share of struggles, such as planning a music festival on a desert island. But the next time the temperature rises about 80 degrees, I implore you to put those things aside, wind down the car windows and be mesmerized. And when she returned with the album “Blackout,” singing, “I’m Mrs. ‘Oh my God, That Britney’s Shameless’,” mocking those that love to hate her, I turned up the volume and pumped my fist. I had the good fortune to take my mom and my then pre-teen daughter to see Taylor and King together in concert about six years ago and there’s a photo of the three generations together. And three summers ago, when I pitched an interview with James Taylor, he accepted. We filmed him rehearsing with his band in a New York studio and it was magic. As his song goes, “Shower the people you love with love, show them the way that you feel.” And as Carole has sung, “My life has been a tapestry of rich and royal hue, an everlasting vision of the ever-changing view.” To James and Carole — with no apologies. It’s actually harder to hate jazz than you think. It’s a million little genres from a million little places. There’s blues and soul, Latin jazz and Afro jazz, Big Band and bebop, fusion, funk and the boisterous deep-belly bass of New Orleans. It’s spontaneous, evocative and always evolving. Rarely are two performances of the same song actually the same. Critics have eulogized jazz over and over (and over) again — yet it always comes back. The 1990s brought A Tribe Called Quest, and even a brief, inexplicable explosion of “metallic jazzcore.” There was Amy Winehouse and the mainstream acceptance of soul-infused Sharon Jones and Trombone Shorty. Willie Nelson’s 2013 album“Let’s Face the Music and Dance” drew on hits from legendary jazz producer Booker T. Jones. In 2015, Kendrick Lamar’s “To Pimp a Butterfly” leaned on jazz saxophonist Kamasi Washington. David Bowie’s final album was backed by an impressive cast of jazz musicians, and Bob Dylan has launched a late-career revival of jazz standards. Jazz is in Erykah Badu, Chance’s “Coloring Book” and Beyonce’s country-crossover “Daddy Lessons.” Odds are you’ve been listening to some form of jazz all along without even knowing it. Yes. Blind Melon’s break out hit was the song “No Rain” that features a girl dressed as a bee. But the band, led by Shannon Hoon, has a rich collection of other songs that have been a big part of my listening life. Take a listen to Blind Melon’s performance of “Change” on David Letterman’s late-night show the day Kurt Cobain killed himself. Hoon, who also sang backup for Guns and Roses, also died young at the age of 28 in 1995. Most people only associate Carly Rae Jepsen with her 2011 breakout hit “Call Me Maybe,” dismissing her as just another bubblegum artist with a song that got too annoying too quickly. If you’ve never listened to her well-reviewed but commercially unsuccessful 2015 album “Emotion,” prepare your ears for pop perfection. Her voice blends beautifully with the underlying synth sound that permeates the album, giving it a retro ‘80s vibe. You’ll be hooked from the first track. But in a way it made me remember that supporting this artist has always been controversial. I remind people of that from time to time, because in the end that’s what I’ve always admired about him: the ability to be unapologetically honest.